South Africa is renowned for having a progressive Constitution with strong protection of human rights, including protection for persons using the public health system. While significant recent discourse and jurisprudence have focused on the rights of patients, the situation and rights of providers of health care services have not been adequately ventilated. This paper attempts to foreground the position of the human resources personnel located at the centre of the roll-out of the government's ambitious programme of anti-retroviral (ARV) therapy. The HIV/AIDS epidemic represents a major public health crisis in our country and, inasmuch as various critical policies and programmes have been devised in response, the key to a successful outcome lies in the hands of the health care professionals tasked with implementing such strategies. Often pilloried by the public, our health care workers (HCWs) face an almost Herculean task of turning the tide on the epidemic. Unless the rights of HCWs are recognised and their needs adequately addressed, the best laid plans of government will be at risk. This contribution attempts to identify and analyse the critical challenges confronting HCWs at the coalface of the HIV/AIDS treatment programme, in particular the extent to which their own rights are under threat, and offers recommendations to remedy the situation in order to ensure the successful realisation of the ARV rollout. South Africa is renowned for having a progressive Constitution with strong protection of human rights, including protection for persons using the public health system.1While significant recent discourse and jurisprudence2have focused on the rights of patients, the situation and rights of providers of health care services have not been adequately ventilated. This paper attempts to foreground the position of the human resources personnel located at the centre of the roll-out of the government's ambitious programme of anti-retroviral (ARV) therapy. The HIV/AIDS epidemic represents a major public health crisis in our country and, inasmuch as various critical policies and programmes have been devised in response, the key to a successful outcome lies in the hands of the health care professionals tasked with implementing such strategies. Often pilloried by the public,3our health care workers (HCWs) face an almost Herculean task of turning the tide on the epidemic. Unless the rights of HCWs are recognised and their needs adequately addressed, the best laid plans of government will be at risk. For the purposes of this paper, the sense of the term 'health care workers' will be confined to those who provide health services. The HCWs involved in the government's ARV treatment programme face many challenges in the course of their duties. This invariably results in their becoming frustrated, disillusioned and demotivated, states of mind which impact negatively on their delivery of an efficient service. Some of these challenges, for example, staff shortages16and the lack of an adequate supply of antiretroviral medication,17have been sufficiently well documented. However, many of the challenges faced by HCWs on a day-to-day basis have not been adequately researched. This paper aims to highlight some of the more significant challenges facing HCWs employed in the government's ARV rollout programme. It is by no means a comprehensive review of all of the obstacles encountered at the various rollout facilities, but rather a discussion of the more pertinent issues that impact on patient management. the emotional impact of their work on HCWs, and the adequacy of support programmes for them. It is contended that the identification of these challenges and obstacles and the institution of appropriate remedial measures will allow for a better-equipped, more efficient workforce and hence more effective treatment of people living with HIV/AIDS. 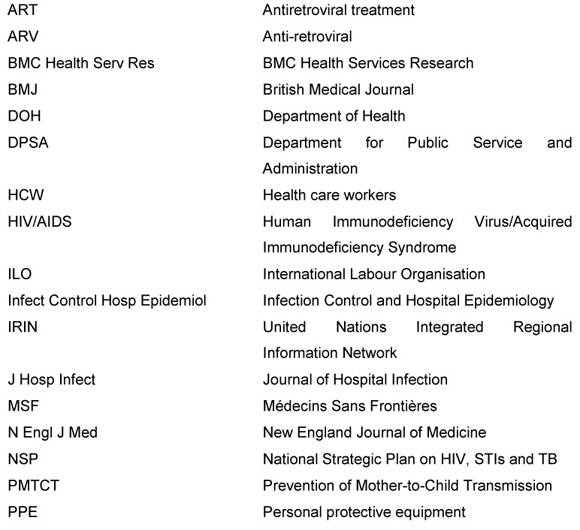 The Health Systems Trust, a non-governmental organisation which has been monitoring the AIDS treatment programme in South Africa since 2003, acknowledges that the single most significant obstacle to attaining public health goals is the lack of adequate human resources.18It concludes that the strategies outlined in the Department of Health's Strategic Plan, 200419have not been effective in addressing the issue. Another crucial factor contributing to the staff shortage is the migration of skilled HCWs to developed countries.25In order to combat this 'brain-drain' phenomenon, South Africa has signed 'memoranda of understanding' with certain countries such as the United Kingdom.26Although these agreements are designed to create obstacles to the migration of HCWs (for example, requiring the writing of various entrance examinations in order to practise, and having to work in a supervised environment for a period), they often exacerbate the frustrations and cause the HCW to become more determined to leave the South African health sector. HCWs in HIV/AIDS treatment facilities are at increased risk of contracting communicable disease, either by direct contact (for example gastroenteritis and scabies) or by droplet spread (for example tuberculosis, pneumonia and meningitis). By virtue of the nature of their patient base, they are also at risk of contracting blood-borne infections such as Hepatitis B or HIV via accidental exposure to blood or other body fluids such as cerebrospinal fluid. Several studies have recognised that the health care workforce in South Africa is adversely affected by HIV and TB.27In countries with a high HIV/AIDS burden, HIV and TB (including drug-resistant strains) together account for an extremely high proportion of the morbidity and mortality experienced by health care workers.28This results in an increase in the frequency of disability and of sick leave taken by HCWs, further burdening the remaining personnel. The WHO advocates primary, secondary and tertiary prevention programmes to curb the risk of and/or effectively treat occupational exposure to HIV and TB.30Primary prevention includes measures aimed at preventing exposure to pathogens (for example respiratory and eye protection, immunisation against Hepatitis, and safe needle technology) and evidence of its efficacy has been well documented.31Primary prevention measures are closely related to environmental factors and are only as effective as the working conditions permit, as will be explained in the following section. It is a reasonable assumption that a safe and well-equipped work environment is conducive to increased productivity, a healthier workforce and improved patient management. For the purposes of this paper, the 'work environment' will be dealt with in terms of the 'physical' environment or the actual structure of the workplace (such as space and ventilation), and the 'functional' environment which includes the tools required for efficient service delivery (personal protective equipment and medical consumables). The physical environment or infrastructure with regard to the health care facilities refers to the state of maintenance of the buildings; the availability of basic services (such as water and electricity); the availability of and access to the necessary technology (for example communication systems and laboratory data information systems); and the availability of functional medical and non-medical equipment.39Infrastructure such as viable surrounding roads and a transport system is also important in facilitating patients' access to the health care facility.40A fully functional, well-equipped and adequately staffed health care facility is of little use if it is inaccessible to those in need of health care. The Occupational Health and Safety Act entitles all workers, including HCWs, to a safe working environment without risk to their health.48The Act also charges employers with the provision of the necessary health and safety measures for their employees.49In the case of public HCWs, the government is responsible for the provision of adequate measures to protect them against health hazards, particularly biological hazards. The most significant challenge with regard to treatment is that of the limited and often inadequate supply of antiretroviral drugs at several ARV facilities.54This is also referred to as drug 'stockouts' and has a detrimental effect on the ARV rollout programme. The second treatment-related challenge faced by HCWs is that of non-compliance, due either to the sometimes severe side-effects or to the lack of patient motivation. This is the primary cause of drug resistance.62Many ARV regimens are complicated and patients have to take multiple tablets at specific time intervals. There are also many adverse side-effects and drug interactions associated with ARV medication.63These factors contribute to non-compliance and hence treatment failure, especially if the patient has not been adequately counselled regarding the importance of the taking of the drugs as prescribed. The treatment of children with HIV/AIDS poses additional challenges. The physiology of a paediatric patient is not simply that of a diminutive version of an adult. HCWs need to be specifically trained in the skill of communication with children, using language that the child can identify with. A thorough knowledge of the spectrum of opportunistic infections that children are vulnerable to is essential in their management. According to Maslach, burnout is 'characterized by emotional exhaustion, depersonalisation and a sense of reduced personal accomplishment, accompanied by a decrease in motivation' and occurs as a result of chronic occupational stress in 'normal' individuals.75Given the current conditions of employment at the government's ARV rollout facilities, it is not unusual for employees to manifest these psychological symptoms. Furthermore, there is an added burden of having in some instances to forcibly restrain and incarcerate patients. A case in point is the isolation for example of patients suffering from the highly infectious extensively drug-resistant tuberculosis (XDR-TB), which was determined by a court to be legal and justifiable.76HCWs in such instances have to contend with complicity in the potential violation of the human rights of their patients, as well as the emotional trauma of being party to the use of extreme and often inhumane measures in dealing with their patients. Although these emotional challenges are recognised by the HCWs themselves, as well as the supervisors of the health facilities, it appears that many HCWs do not have access to facilities to assist them in dealing with these issues. This section outlines some remedial measures advocated in order to alleviate the problems faced by HCWs. The efficacy of these measures will also be assessed as they apply to the South African context. South Africa has implemented task shifting since 2010.86To date, no large scale objective study has been undertaken with regard to the success, efficacy and/or shortcomings of this approach.87It is submitted that task shifting will be a viable option only if the lower-qualified personnel are adequately trained and if the quality of patient care is not compromised. If these standards are not monitored and maintained, then the risk of complications from incorrectly administered antiretroviral treatment will be detrimental to the process in the long term. It is therefore vital that task shifting be implemented along with other measures to increase and maintain the workforce, such as increasing the number of students training for employment in the health care sector and improving the current working conditions to an acceptable level. In particular Lund,88for example, cautions against the 'gendered implications' of task shifting as a greater burden may be placed on women (the majority of nursing staff) in both institutional and home-based settings. Many health care workers migrate to developed countries in pursuit of better working conditions and remuneration. In order to curb this, the South African government entered into agreements with certain developed countries.89As was stated earlier, these restrictions appear to have achieved the opposite effect.90It is submitted that a secondary disadvantage of these restrictions is that HCWs who supplement their knowledge or acquire new skills in the developed countries are unlikely to return to South Africa and promote training and development in this country. It is submitted that, given the high prevalence of blood-borne diseases (Hepatitis B and HIV) and air-borne pathogens (Tuberculosis, including multidrug-resistant strains) in South Africa, all HCWs should exercise both standard and additional precautions at all times. It is further submitted that exercising these precautionary measures is not always feasible, especially in busy health care facilities, or if there is an inadequate availability of personal protective equipment (PPE). Blood carries the highest concentration of HIV or Hepatitis in infected patients, and the most common route of accidental exposure to these pathogens amongst HCWs is via needlestick injury.95HIV seroconversion following a needlestick or other 'sharps' injury from an infected patient is less than 0.5%, but this risk varies depending on the patient's viral load, the depth of the penetrating injury and the use of protective equipment.96Primary prevention measures should therefore be focused mainly on the prevention of needlestick injuries. The Employee H&W Framework provides for 'policies, systems, programmes, compliance measures, monitoring and evaluation of occupational health interventions on prevention, treatment, care and compensation of occupational health diseases'.101Although this framework is an elaborate overview, the document provides no clear guidelines on how its goals will be achieved or how progress will be monitored. Thus there is no measure of the efficacy of this framework at the service-delivery level. The NSP Midterm Review 2010 cites the lack of adequate data collection, collation and dissemination as possible obstacles to policy evaluation.102It is submitted that an effective monitoring and evaluation system, preferably employee-driven, will assist in highlighting the health concerns faced by employees, and in the formulation of policies to address these concerns. The current physical environment or infrastructure of health care facilities has been found to be in a poor condition as well as inadequate in addressing the needs of the patient population served.103The 2007 study by Lutge and Mbatha recommended the rehabilitation and maintenance of existing infrastructure to ensure safety and planning for infrastructure development, in order to accommodate an increased patient population.104It is submitted that these recommendations should be expanded to include diagnostic and monitoring equipment essential for patient management. Despite current budget constraints, the provision of adequate space and ventilation in order to protect patients and HCWs from air-borne infection cannot be compromised. A related and equally important requirement is the provision of private consulting rooms, which need to be designed to protect patients' dignity and privacy, especially during clinical examination. The SAMWU 2004 study revealed that, in the health facilities evaluated, 'no proactive or preventive procedures are in place for identifying hazards, evaluating risks, preventing workplace injury and illness, and maintaining a safe workplace'.106It was also revealed that the supply and use of PPE was inadequate.107The inconsistent use of PPE may be due partly to the lack of education and motivation and partly to the overwhelming workload. These factors increase the health and safety risks faced by HCWs on a daily basis. The NSP 2012-2016 envisages initiating 'at least 80% of eligible patients on antiretroviral treatment (ART), with 70% alive and on treatment five years after initiation'113for the period of the plan.It is submitted that in order to realise this goal, a cheaper, equally effective and uninterrupted ARV drug supply is required. Although the lack of patient compliance is frustrating for HCWs, who have to deal with additional disease complications, the patients' reasons for attrition and non-compliance warrant investigation. It is submitted that although these recommendations are reasonable, their implementation is not practical in view of the current staff shortages taken together with the environmental constraints described above. It is suggested that paediatric-specific training for all HCWs should be included during basic training and supplemented by regular in-service training and development programmes. Emotional exhaustion and fatigue are extremely common amongst HCWs as they work under great pressure, dealing with large patient volumes, and 'meeting death and misery on a daily basis' - all of this without adequate compensation, encouragement and training.122At present there are no structured programmes in place to identify HCWs at risk for emotional burnout and to provide them with the required counselling and support. Most ARV treatment centres now employ lay counsellors as part of their health care staff in order to alleviate the burden faced by professional HCWs.123It is submitted that this 'task shifting', if not supplemented by other remedial measures, will not improve the staffing situation. HCWs play a vital role in the implementation of the country's health policy and the provision of health care services. They have the responsibility of ensuring that the government's health policies are translated into effective and efficient service delivery. However, their rights are often overlooked, and many HCWs are subject to poor working conditions, long hours and inadequate remuneration. As a result many HCWs have chosen to leave the public health sector. Some have moved to the private sector where conditions are better, and many have emigrated. The single most important factor in achieving a successful ARV rollout programme is the retention and expansion of the present workforce. However, this cannot be addressed in isolation as there are various factors contributing to workforce attrition that need to be simultaneously addressed. Although adequate remuneration for HCWs is important, non-financial incentives such as the improvement of working conditions and the provision of much needed support facilities are equally vital. Upgrading the infrastructure within and around health care facilities with the provision of safe water and adequate sanitation facilities, and the availability of the correct quantity and dosage of ARV drugs, will contribute to the creation of conducive working conditions and an effective ARV programme. Ensuring the availability of effective PPE, reducing the number of hours spent on duty per shift, and ongoing education of the workforce with respect to infection control could dramatically decrease the incidence of adverse events in the workplace. Ongoing in-service training aimed at improving overall skills as well as specific training in dealing with paediatric cases will increase HCWs' confidence and result in more effective service delivery. HCWs treating patients living with HIV/AIDS experience significant psychological and emotional stress. Mechanisms should be in place to ensure that these individuals have timeous access to counselling and support facilities. HCWs are the backbone of the ARV rollout programme. Thus, their complaints and grievances need to be urgently addressed. To this end, efficient monitoring and evaluation of all ARV rollout facilities should be undertaken in order to identify the deficiencies and institute remedial measures. The involvement of HCWs in the decision-making process, as well as setting time limits for the completion of specific interventions, will contribute to a more transparent process and better outcomes. The government has made a commitment to expand the ARV rollout programme. The success of this programme will depend greatly on the HCWs implementing it. Furthermore, a key objective of the proposed National Health Insurance127is 'to strengthen the under-resourced and strained public sector so as to improve health systems performance.' It is imperative that due cognisance be paid to the rights of HCWs if we are to succeed in achieving these lofty objectives. 1 Section 27 Constitution of the Republic of South Africa, 1996 guarantees a right of access to health care; the National Health Act 61 of 2003 contains extensive provisions on the rights of users and providers of the health system; and a range of other legislation such as the Occupational Health and Safety Act 85 of 1993 is applicable. 2 For example, the cases of Soobramoney v Minister of Health, KwaZulu Natal 1998 1 SA 765 (CC) and Minister of Health v Treatment Action Campaign (Case No 2) 2002 5 SA 721 (CC). 3 See for example Cullinan 2006 http://www.health-e.org.za. 5 Minister of Health v Treatment Action Campaign (Case No 2) 2002 5 SA 721 (CC). 8 WHO/AIDS/UNICEF 2010 http://www.who.int. More recent statistics indicate the South Africa's coverage is in the 40% to 59% bracket (UNAIDS 2011 issuu.com). 11 Barbara Hogan, Minister of Health (2009) 4th SA AIDS Conference. 16 AFP 2005 http://www.iafrica.com; Michaels et al Exploring Current Practices 32-35. 17 Michaels et al Exploring Current Practices 33. 18 Jaskiewicz et al 2010 SA Health Review. 22 SA National AIDS Council 2010 http://www.healthlink.org.za. 23 SA National AIDS Council 2010 http://www.healthlink.org.za 30-31. 24 SA National AIDS Council 2010 http://www.healthlink.org.za 44. 25 DOH 2004 http://www.doh.gov.za 21. 26 IBP Knowledge Gateway 2003 knowledge-gateway.org. 27 Ncayiyana 2004 BMJ 584-585; Connelly 2007 SAMJ 115-120; Shisana 2007 SAMJ 108-109. 31 WHO/ILO 2010 whqlibdoc.who.int 33. 32 WHO/ILO 2010 whqlibdoc.who.int 33. 33 WHO/ILO 2010 whqlibdoc.who.int 33. 34 WHO/ILO 2010 whqlibdoc.who.int 13. 35 DPSA Employee Health and Wellness Strategic Framework. 37 DPSA Employee Health and Wellness Strategic Framework Annexure A. 38 DPSA Annual Report 11. 39 Lutge and Mbatha PHC Facility Infrastructure. 40 Lutge and Mbatha PHC Facility Infrastructure. 41 Lutge and Mbatha PHC Facility Infrastructure; King and McInerney 2006 Curationis 70-81. 42 Michaels et al Exploring Current Practices 36-37. 43 Michaels et al Exploring Current Practices 36-37. 44 Section 14(d) Constitution of the Republic of South Africa, 1996. 45 Information from one of the author's personal experience of working in a government ARV clinic in Durban. 46 Information from one of the author's personal experience of working in a government ARV clinic in Durban; Levin "Lecture"; Curtis 2008 J Hosp Infect 204-219. 47 Most of the relevant studies have been conducted by the South African Municipal Workers Union, as detailed below. 48 Section 8(1) Occupational Health and Safety Act 85 of 1993. 49 Section 8(2) Occupational Health and Safety Act 85 of 1993. 50 Marcus 1988 N Engl J Med 1118-1123. 51 SAMWU Who Cares for Health Care Workers? 43-44. 52 SAMWU Who Cares for Health Care Workers? 43-44. 53 SAMWU Who Cares for Health Care Workers? 43-44. 58 UNGASS 2010 http://www.unaids.org 100. 59 UNGASS 2010 http://www.unaids.org 100. 60 Cornell 2010 AIDS 2263-2270. 61 Personal communication with Prof L Hadley, Head of Paediatric Surgery at Inkosi Albert Luthuli Hospital on 16 March 2011. 63 Maskew et al 2007 SAMJ 853-854. 64 Noorbhai Adolescent Females 13. 65 Health Systems Trust 2005a http://www.hst.org.za. 66 Health Systems Trust 2005a http://www.hst.org.za 15. 67 Michaels et al Exploring Current Practices 33. 68 Michaels et al Exploring Current Practices 55. 69 Michaels et al Exploring Current Practices 42. 70 Michaels et al Exploring Current Practices 33. 71 Dagied et al 2007 http://www.hsrc.ac.za. 72 Held and Brann 2007 AIDS Care 212-214. 73 Orner 2006 AIDS Care 236-240. 74 Orner 2006 AIDS Care 236-240. 76 Minister of Health of the Province of the Western Cape v Goliath 2009 2 SA 248 (C). 77 Section 20 National Health Act 61 of 2003. 78 For a general discussion of the rights and duties of health care workers, see Hassim et al Health and Democracy 316-347. 80 Médecins Sans Frontières 2009 MSF. 84 Morris et al 2009 BMC Health Serv Res 9. 85 WHO 2008 http://www.who.int Annexure A. 86 GG 33188 of 14 May 2010. 87 Internet search results reveal a small-scale assessment of rural clinics by the Treatment Action Campaign, which shows that many clinics have adopted task shifting to some degree. However, some of the nursing staff initiating antiretroviral treatment are not adequately trained. 88 Lund 2010 International Labour Review 505. 89 DOH 2006 http://www.safaids.net 21. 95 Centers for Disease Control 1988 Morbidity and Mortality Weekly Report 377-388. 96 Cardo 1997 N Engl J Med 1485-1490. 97 Ziady 2010 Professional Nursing Today 6-7. 98 Fisman et al 2007 Infect Control Hosp Epidemiol 10. 99 Health Systems Trust 2005b http://www.hst.org.za. 100 Health Systems Trust 2005b http://www.hst.org.za. 101 DPSA Employee Health and Wellness Strategic Framework 14. 102 SA National AIDS Council 2010 http://www.healthlink.org.za 47, 75. 103 Lutge and Mbatha PHC Facility Infrastructure 2. 104 Lutge and Mbatha PHC Facility Infrastructure 6. 106 SAMWU Who Cares for Health Care Workers? 107 SAMWU Who Cares for Health Care Workers? 113 DOH 2011 http://www.anovahealth.co.za 12. 114 Rosen et al 2007 PLoS Medicine. 116 Miller et al 2009 http://www.ncbi.nlm.nih.gov. 117 'Loss-to-follow-up' refers to patients who are initiated on ARV treatment but thereafter default on their treatment and fail to attend subsequent clinic visits. There are various reasons for loss-to-follow-up, including the lack of motivation, the lack of access to treatment, and the disability or death of the patient. 118 Michaels et al Exploring Current Practices 52. 119 Michaels et al Exploring Current Practices 53. 120 Michaels et al Exploring Current Practices 53. 121 Michaels et al Exploring Current Practices 56. 122 Dagied et al 2007 http://www.hsrc.ac.za. 123 Dagied et al 2007 http://www.hsrc.ac.za. 124 Dagied et al 2007 http://www.hsrc.ac.za 21. 125 Dagied et al 2007 http://www.hsrc.ac.za 21. 126 Orner 2006 AIDS Care 236-240.